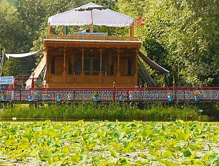 The Royal Group of Houseboat is famous for offering outstanding houseboat or Shikara services allowing guests to enjoy an amazing boat ride at the Dal Lake in Srinagar. Located near Guroo Manzil on the bank of the Dal Lake, houseboats of the Royal Group consist of well-furnished and comfortable rooms with lavish dining hall, balcony, 2-5 bedrooms and upper deck. 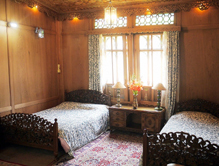 All the houseboats have interiors made of cedar wood giving a royal feel to the travelers to Srinagar. Guests can visit the Hari Parbat Fort, which is a 10 minutes drive away from the hotel. The Royal Group of Houseboats offers a perfect blend of comfy accommodation and friendly hospitality to attract lots of tourists every year and making a contribution in the growth of Srinagar tourism. How to Book: At Tour My India, we make the process of booking a comfortable and hassle-free accomodation in one of the houseboats of the Royal Group easier for you. You simply need to drop an email to us or contact our executive and state your requirements and we will get your booking done. In addition to booking rooms in the houseboat in Srinagar, we also organize various sports activities to make your leisure time interesting.